As the relations become too sensitive so the atmosphere of the palace was. It was Ji Monk who console the King as he knew if Hae Soo wouldn't be on King side he won't focus and will sure lose interest in his throne. He request King not to let Hae Soo not like this. Sending her away in this way will give him more pain but the King told Ji Monk it was Hae Soo's choice he threw me away i didn't threw her. Baek Ah came to said the last goodbye to Hae Soo and told her what if he knew that Hae Soo actually send this kind of message he wouldn't have helped her so easily. Seeing them together we become a little emotional as it was long time relation and they lived in the same place. Bt nothing could of be the help it was Hae Soo's fate and her own choice to leave the palace. Baek Ah cherish the relationship and friendship he develop with Hae Soo and told her that he will going to miss her. Hae So also didn't forget to remind Baek Ah to get her act together and live a happy life nothing will gain by sitting it idly. Baek Ah told Hae Soo that it would be good if Hae Soo lived with his brother Wang So. 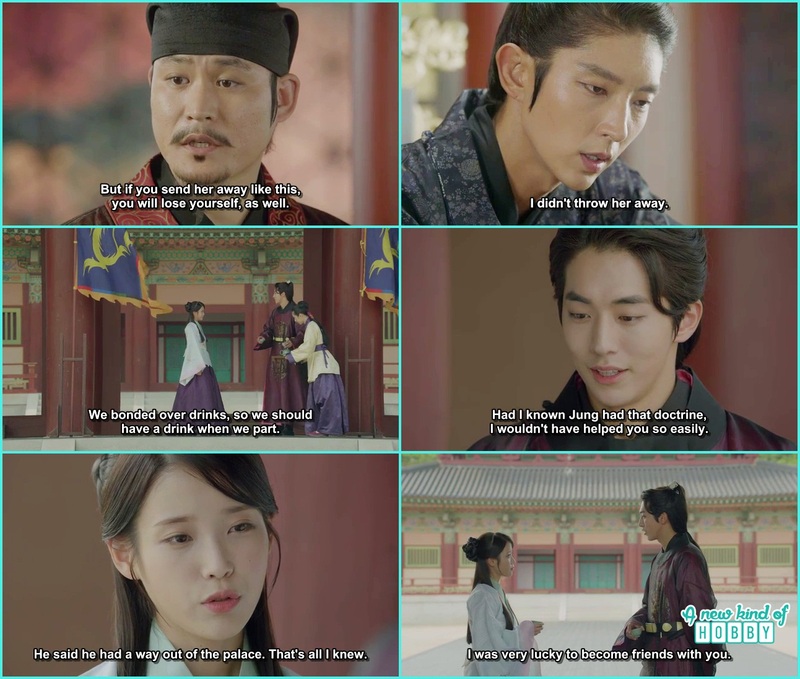 But Hae Soo tell Baek Ah that between their relationship there happen to be lot of blood and she didn't have enough courage to live and develop a relationship over to people blood That's the better choice to leave she sure have a practical mind and thinking which let her to make ways part. It wasn't only Baek Ah who say the last goodbye to Hea soo. But Wook also came to say hi slast goodbye. He looks all broken and lifeless though we have never liked Wook's character from the start but still we miss the shine and smile from his face. 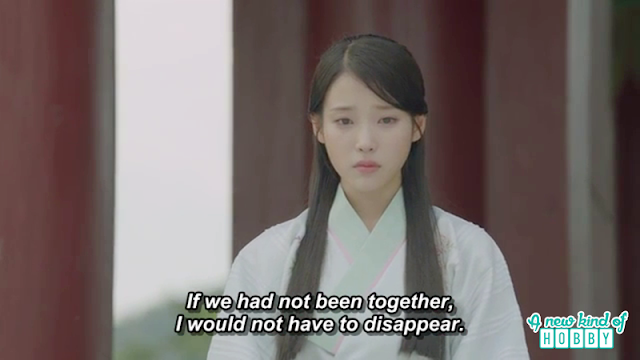 Hae Soo thanked Wook what if he didn't those thing it would be difficult for her to leave the palace easily. Wook tol Hae Soo not to be sad and forget everything that happened in the past. Live a happy life. 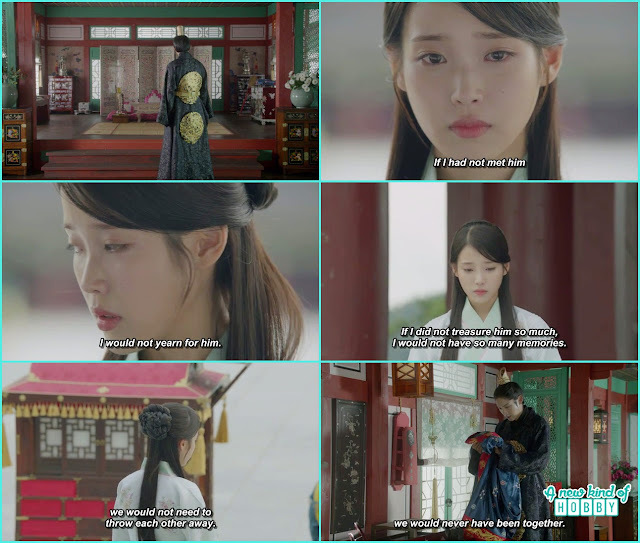 Hae Soo with the heavy heart leave the palace and she only didn't leave the palace all the smile of king was also gone along with Hae Soo. He become too miserable and lose interest in palace and governmental affairs. For King Wang So without Hae Soo there wasn't any thing of interest worth doing. He came to Hae Soo's room and cried holding her gown. It was the gown Hae Soo wanted to wear for King Wang So as to be his bride.